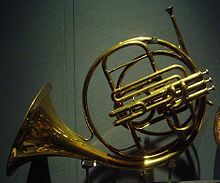 The Vienna horn is a special horn used primarily in Vienna, Austria. Instead of using rotary valves or piston valves, it uses the Pumpenvalve (or Vienna Valve), which is a double-piston operating inside the valve slides, and usually situated on the opposite side of the corpus from the player's left hand, and operated by a long pushrod. 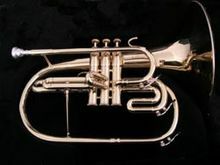 Unlike the modern horn, which has grown considerably larger internally (for a bigger, broader, and louder tone), and considerably heavier (with the addition of valves and tubing in the case of the double horn) the Vienna horn very closely mimics the size and weight of the natural horn (although the valves do add some weight, they are lighter than rotary valves), even using crooks in the front of the horn, between the mouthpiece and the instrument. Although instead of the full range of keys, Vienna horn players usually use an F crook and it is looked down upon to use others, though switching to an A or B��� crook for higher pitched music does happen on occasion. 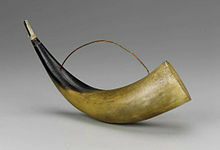 Vienna horns are often used with funnel shaped mouthpieces similar to those used on the natural horn, with very little (if any) backbore and a very thin rim. The Viennese horn requires very specialized technique and can be quite challenging to play, even for accomplished players of modern horns. 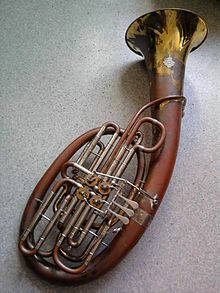 The Vienna horn has a warmer, softer sound than the modern horn. Its pumpen-valves facilitate a continuous transition between notes (glissando); conversely, a more precise operating of the valves is required to avoid notes that sound out of tune.